Apple Officially has launched the iPad, essentially a scaled up iPhone, and judging by the model number, it started development several years ago around the time of the first iPod Touch. Many of the components are similar to the iPhone, if not the same. 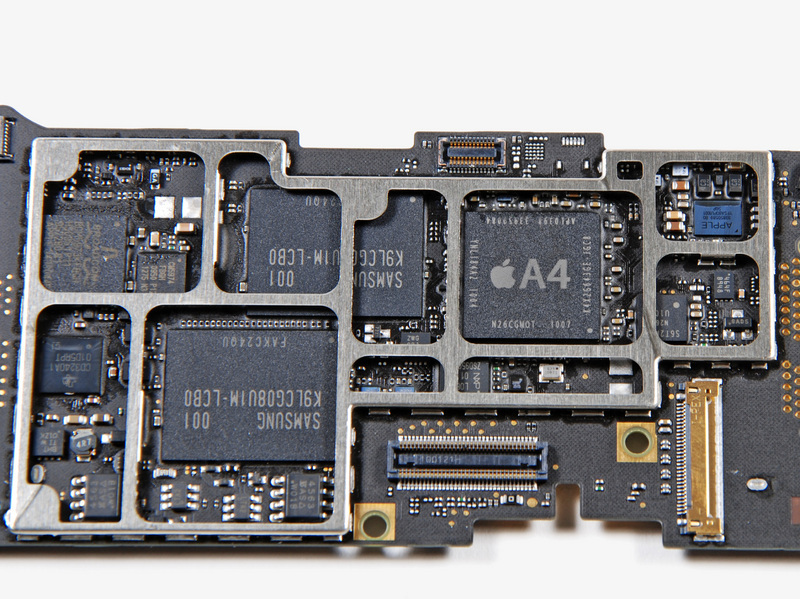 Obviously the biggest processor ews is the Apple A4 ARM processor at its heart. Its developed by Apple, and built by Samsung. a multi-die package, it includes the ARM processor, and PowerVR Graphics on one die, and then two 128MB DRAM dies as well. What is interesting about the A4? It has a 64bit memory bus, rather then the more standard 32bit but found on most ARM devices. This likely for faster memory access to support faster graphics. 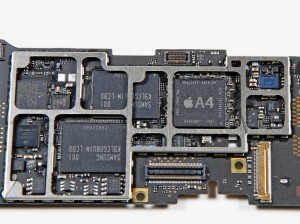 The screen controller is the Broadcom BCM5973/5974 which has been used by Apple for several years. The Baseband processor in the 3G version is the Infineon X-Gold 608 which contains a 312MHz ARM926 processor, a 2007 design, so probably saved Apple some money. So all told the iPad 3G contains at least 4 seperate processors. In related news rumors are flying about Apple acquiring Intrinsity. Instrinsity is a processor design house which specializes in, you guessed it, ARM processors. Its likely they have helped Apple more on the A4 then P.A. Semi (another Apple acquisition) This is further supported by the fact that Intrinsity has worked a lot lately with Samsung in developing a 1GHz ARM CPU (the Hummingbird). Who fab’s the A4? Yah, Samsung.